Today I had a little time to play around and try again my skills in converting interesting themes for Word Press. My new try is Stockholm. You can see the original theme here. 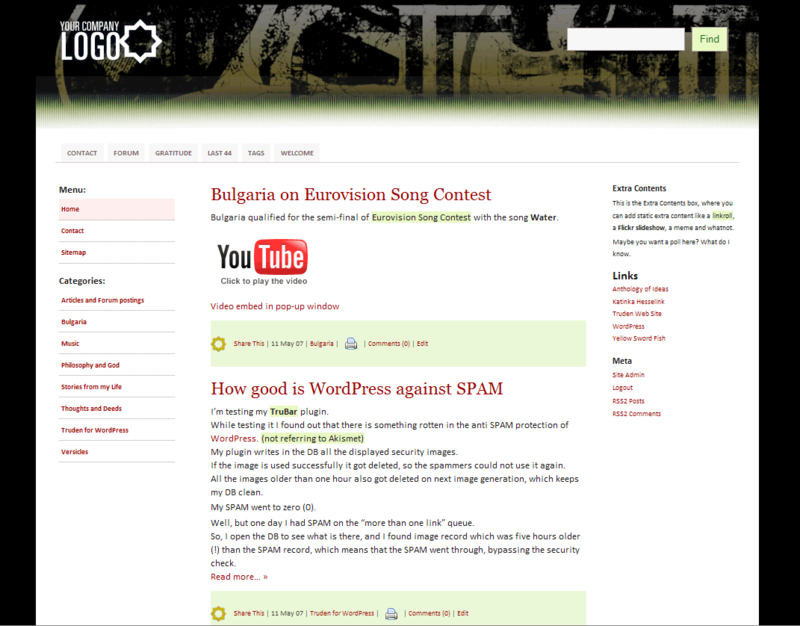 And here is the screenshot of my work. It is three columns, widget ready theme. There are so many WordPress themes out there, but none of them satisfies my taste. So, I decided to do it myself. Here it is “Black on White” based on Luka’s “Internet Corporation” theme. Download the theme if you like it. [UPDATE] TruBar is updated to 4.1(Silent). The installation process is simplified and all possible cookie problems are cleaned off. The download link points now to the new version. That made me feel guilty. It is hard enough to click on the “Submit” button EVERY TIME you post. Why should I give you some more pain!? Then I made TruBar 4.0(Silent). But… you have to click in the text area every time you start typing. Some people are happy with the SPAM in Akismet spam-bin, but not happy with the robot registration in their weblogs. It is called TruBar 3.0(Reg) and it protects only the registration form. So, if a bot wants to register on your weblog, it will meet TruBar. This plugin does not protect against comment SPAM. [UPDATE] TruBar 3.0(Reg) is updated to TruBar 3.1(Reg). The installation process is simplified and all possible cookie problems are cleaned off. Read the INSTALL.txt in the ZIP. TruBar 3.0(Lessen) stops 100% of the automated spam, but I had to change it. You can see how TruBar 3.0(Lessen) works on the registration page. [UPDATE] TruBar 4.0(Silent) is updated to TruBar 4.1(Silent). The installation process is simplified and all possible cookie problems are cleaned off. [EDIT] If you need help for this plugin, please visit TruBar home page. You all are sick and tired of the spam in your Akismet spam-bin. Right? In coding we give cookies to the registered user, or to mark preferences or for thousands of other things. We never give cookies to the robots, because no robot will take cookie to mark itself as a robot. Then why not giving cookies to the human users? If the user doesn’t hold a cookie it is to show that this user is not human. There are many ways to give cookie to human and one only way for the robots – find it. But we can help robots to find the wrong cookies. TruBar has plenty of them.